I am no longer jealous of B and Benji being best buds at home because now I too have a baby meow who loves snuggling up to me! Pablo my new baby cat addition to Meow Diaries is truly so affectionate and playful and all he really wants to do whenever he sees me is climb on top of me, lick my face all over, bite my chin and kiss my cheeks! I love it although this is really not good for my sinus problem; having cat fur directly in my face. However, since Pablo is so adorable and tiny, I can’t bring myself to push him away. End result? I have been getting sinus attacks every other day! Maybe when he grows bigger I will be stricter with Pablo and won’t let him flaunt his fur all over my face but for now he is still a tiny baby boy and I will continue enjoying him making a fluffy furry mess on top of me and my face. Achoo!! oh he's name is quite unique for a cat... i wonder where did you get his name..
eh we have same age boys lah.. lol! :* :* :* Aloha Jean, FC! But careful with the sinus prob sweetie..
Wowww.. I'm sure having Pablo around is such a different change, kan? So manjaaaa! Unlike Chubbs and Phoebe yg you have to kejar around and catch to give them a big hug! :) Why is it they're not manja with you, btw? You've had them for years!! Perhaps dah besar, kan? hahaha like kids also.. kecik2 manja lah.. dah besar, want to give them a hug pun, they get embarrassed. LOL! Thanks so much GK, Pablo is so manja I also donno what to say la, forever climbing on top of me, thank goodness he is tiny ha ha!! Shemah! Manja gila Pablo semua org dia tak kasi chance.. asyik wan to cuddle with me only aiyoooo I also rimas sometimes ha ha! Chubbs is manja with me but ikut mood dia and Phoebe least manja, I have to force her to sleep with me tu , but of course all are cute and all have their own unique personalities. 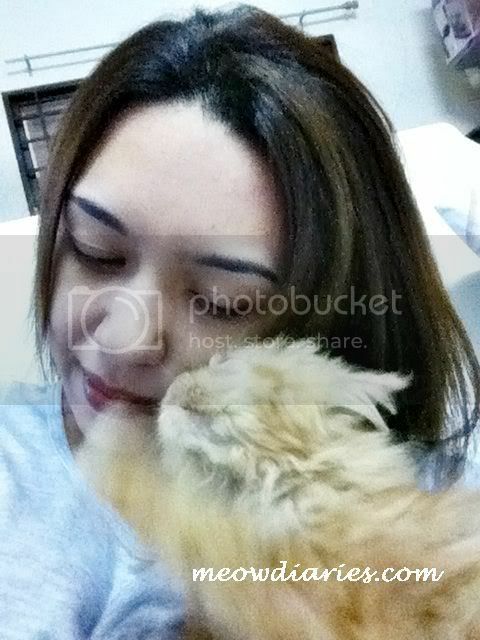 Benji manja dengan B only, hardly wants to berpeluk with me boo hoo! I am having a sinus attack as we speak, achooooo! Yeah so tired of my sinus prob sweetie, achooo! what a great addition to the family. nice to meet you Pablo. i hope he's comfortable in his new home, friends and environment. how precious and super duper cute. i so want to give him a big hug now. 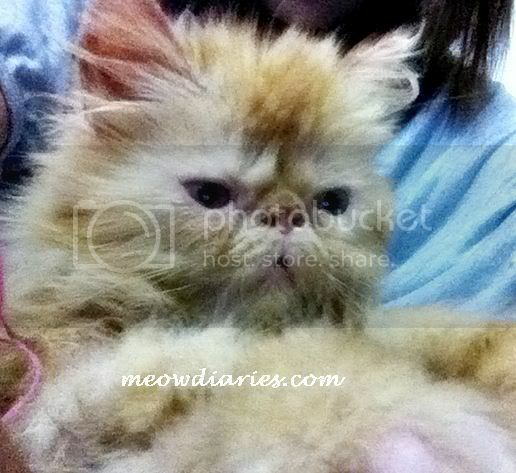 wah, wah got new kitty... aiyooo im so ketinggalan la. sori Ive been bz, nak baca blog pun lazy edi... :-[. 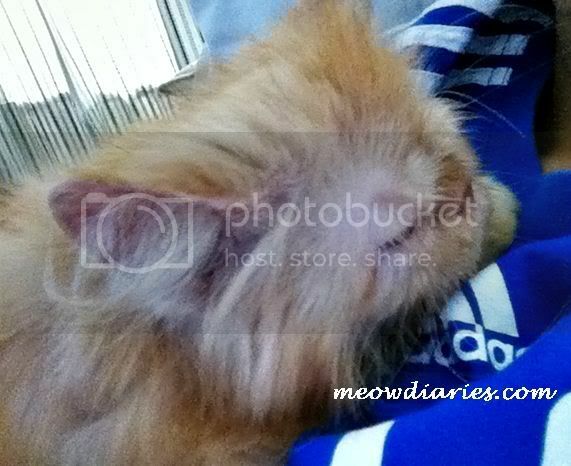 Ooooh Pablo is so manja with u, love the last pic, mcm baby je... so nice sleep on ur chest summore, hehehe. eh Phoebe tak jeles ke?? salute la u can manage 4 cats... so happening at home ye :-D ;) My niece has 5 or issit 6 cats back home kat kampung. they're very close and manja with her oso... everywhere she goes, they follow... like shadow! LOL!